Goldcoast Ballroom & Event Center | Sunday Afternoons in April - Salsa on 2 with Gaelle & Cliford Jasmin - European Salsa Champions - From Paris to Florida!! 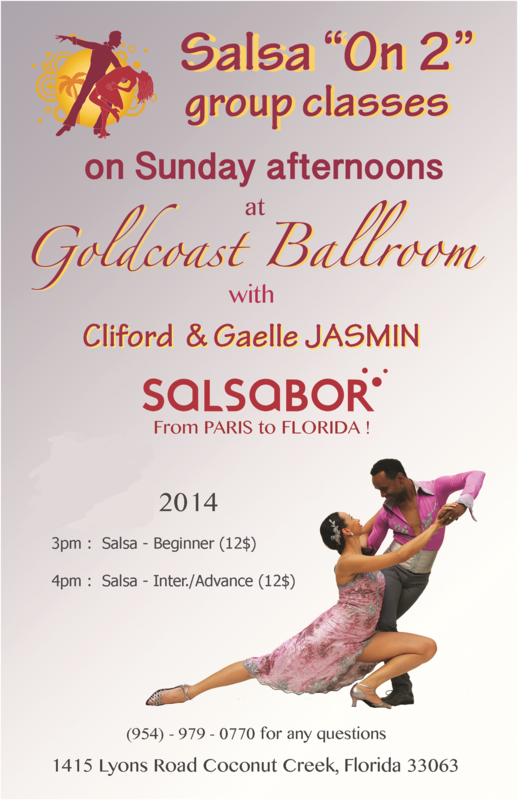 Sunday Afternoons in April - Salsa on 2 with Gaelle & Cliford Jasmin - European Salsa Champions - From Paris to Florida!! 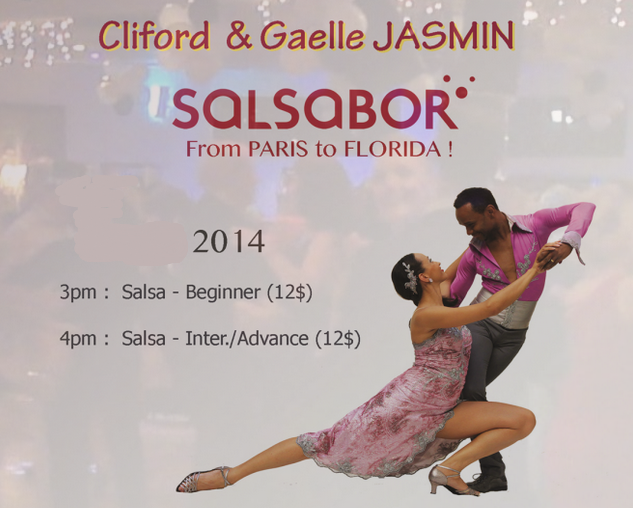 Salsa on 2 – with Gaelle & Cliford Jasmin!! European Salsa & Latin Champions — From Paris to Florida!! Very exciting News!! From Paris to Florida – European Champion Salsa and Latin Dancers Clifford & Gaelle Jasmin will continue teaching “Salsa on 2” at Goldcoast Ballroom Sunday afternoons in April, 2014!!! In the Beginners class, Gaelle and Cliford teach Salsa footwork and partner work for beginners. They also introduce you to musicality in Salsa on 2. Don’t miss this opportunity to learn Salsa on 2 from World Class Salsa Champions, Gaelle & Cliford Jasmin!! In the Intermediate/ Advanced class, Gaelle and Cliford build on what you learned in the Beginners class. They teach Salsa footwork, shines, and partner work with styling for advanced students. For the Intermediate/ Advanced class, it is necessary to know well all the basics and understand the timing. Don’t miss this opportunity to advance your Salsa to the next level and learn some very cool moves in Salsa on 2 from World Class Salsa Champions, Gaelle & Cliford Jasmin!! Immediately after the Intermediate/ Advanced Salsa Class! !